ProMedia LLC, the leader in muscle car motorsport events and publishing, was founded in 1998 by performance enthusiasts who recognized the incredible growth and popularity of street-legal drag racing. ProMedia Events (NMRA and NMCA) produces up to sixteen national motorsport shows each year, attracting hundreds of thousands of racers and fans. ProMedia Publishing (Race Pages, Fastest Street Car, NMRA Digital and NMCA Digital) delivers the best in all-domestic drag race action, tech, features, and more each and every month. ProMedia Events debuted in 1999 with the much-anticipated launch of the NMRA Ford Nationals, which quickly secured a #1 position in Ford Drag Racing by the end of 2001. Following-up on its winning formula for event production, ProMedia Events successfully launched the PRO-Edelbrock Drag Racing Series in 2003, and later branded it with the newly acquired NMCA name in 2005. 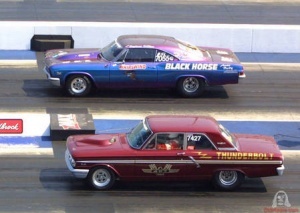 Today, the NMRA Ford Nationals and the NMCA Hot Rod & Muscle Car Nationals are the undisputed leaders in street-legal drag racing and motorsport shows. For 2011 Flowamaster replaced Edelbrock as the series sponsor, and the points format returned to the "Best 5 of 7" events vs. the previous two years "Points Chase" format. 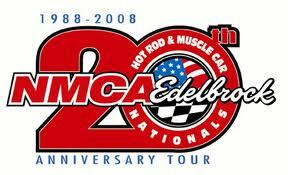 Pro Street vehicles are the fastest and quickest vehicles in the NMCA series. Pro Street provides the ultimate in street-legal drag racing with 6-second passes at over 200 MPH. Pro Street is designed for both stock appearing and Outlawstyle bodied vehicles. Pro Street entries are permitted small block and big block engines up to and including a maximum of 865 ci depending on ­combination. Single power adder naturally aspirated, supercharged, nitrous oxide, or turbocharged engine combinations are permitted using both gasoline and alcohol as fuel. Pro Street permits a variety of race-proven modifications and performance enhancements on from-the-ground-up, purpose-built vehicles. Pro Street class is for American production cars and trucks. Qualifying Information, Ladder Type, & Tree 16 Car Qualified Field, NHRA Pro Ladder, .400 Pro Tree, Heads-Up. In situations where there are greater than 16 cars entered, and the field has not been filled with a full official 16 qualified cars, points standings of the entered vehicles will determine which of the non-qualified ­vehicles will be placed on the ladder. Super Street 10.5W vehicles are the fastest and quickest vehicles in the NMCA series designed for stock bodied vehicles. Super Street 10.5W entries are permitted small block and big block engines up to and including a ­maximum of 830 ci depending on combination, and ­compete with up to a 33x10.5”W” tire. Single power adder supercharged, nitrous oxide, or turbocharged engine combinations are permitted. Super Street 10.5W class is for 1950 and newer American production cars and trucks. Full tube chassis vehicles prohibited. Qualifying Information, Ladder Type, & Tree All Run, NHRA Sportsman Ladder, Pro .400 tree, Heads-Up. Nostalgia Pro Street vehicles are designed for American production passenger cars and trucks, 1950 & later, back half and tube chassis vehicles that emulate the famous “Pro Street” vehicles of the early 90’s that defined the Street movement. Nostalgia Pro Street vehicles are ­permitted small block and big block engines with nitrous oxide as the only permitted power adder on certain ­combinations. Xtreme Street is designed for small-block and big-block single power adder 1950 and newer American production vehicles. Supercharged and nitrous oxide engine combinations are permitted with a maximum cubic inch of 565 depending on combinations. Xtreme Street permits a variety of race-proven modifications and performance enhancements on stock steel bodied, stock appearing vehicles, with stock type chassis and frame rails. Xtreme Street competes on a true 10.5-inch wide slick and no wheelie bars are permitted. Xtreme Street racing will be conducted at all drag racing events (see race schedule). Pro Stock is a naturally aspirated class designed for 1950 & newer American production cars and trucks that are equipped with stock-type chassis and 10.5-inch wide tires. Pro Stock entries are permitted small block and big block engines up to and including a maximum of 565 ci (depending on combination). Pro Stock permits a variety of race-proven modifications and performance ­enhancements on stock bodied, stock appearing ­vehicles. Suspension is restricted to stock-type or ladder bars. Pro Stock will be conducted at all drag racing events (see race schedule). Mean Street is an entry-level non-power adder class in the NMCA-Edelbrock series. Mean Street is designed for naturally-aspirated, street equipped, cars and trucks. Mean Street entries are permitted small blocks with a maximum of 385 ci. Mean Street permits a variety of race-proven modifications and performance enhancements on stock bodied, stock appearing vehicles. Mean Street class is for 1950 and later American production cars and trucks. Mean Street racing will be conducted at all drag racing events (see race schedule). 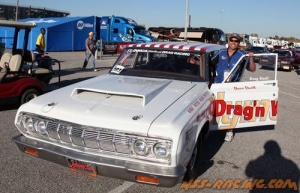 Street Radial is the ultimate “real world” class in the NMCA-Edelbrock series. Street Radial is a class designed for real street cars and trucks equipped with DOT-legal 275 street slicks. Street Radial entries are ­permitted EFI or carbureted nitrous-equipped, ­supercharged, or turbocharged small block up to 415 ci, or carbureted big block engines up to 510 ci. Street Radial permits a variety of race-proven modifications and performance enhancements on stock bodied, stock appearing vehicles. Street Radial class is for 1950 and later American production cars and trucks. Each event, the winner of the Street Radial will be required to carry 20 additional lbs for the next NMCA event, and the runner-up will be required to carry an additional 10 lbs. This weight adder will be cumulative through the racing season, adding up each event. At the conclusion of the season, all racer weights will be reset to zero. Late-Model EFI is designed for Late Model production domestic “hot rod” vehicles which are OEM-equipped with electronic fuel injections. Late-Model EFI approved body styles are permitted. Vehicles must run engine type originally installed in vehicle. Late-Model EFI is based on an index which you must choose during the tech-in process or prior to the first scheduled ­qualifying run. Once a qualifying run has been made, changing your index is prohibited. The closer you ­qualify to your index, the higher you will qualify. All runs made faster than your index will be disqualified. Late-Model EFI racing will be conducted at all drag racing events (see race schedule). Open Comp class is designed for any year, make, and model vehicle & truck. Dragsters and roadsters ­prohibited. SUVs (such as Ford Explorer, Chevy Blazer, etc.) permitted. The Open Comp class will run on an Open Comp format with a 1-tenth (1/10th) breakout. Accepted Products: Accepted Products Deadline: NMCA will accept requests from manufacturers to have new products ­considered for addition to 2010 accepted lists only up until November 10, 2010. After this date, NMCA will ­consider manufacturer requests for new products for the 2011 season. Qualifying Information, Ladder Type, & Tree The class will be qualified by positive reaction time (r/t) closest to “.000” based on a Pro .500 Tree. “.000” is considered perfect. Any negative r/t (-.001, -1.231, etc.) will be placed at the bottom of the qualifying ladder, the more negative the r/t is, the farther down the ladder the run will be placed. For cases in which identical ­reaction times are made, qualifying position will be based on a first-come first served: the first occurring r/t will be placed #1, the second occurrence of said r/t will be placed #2, and so on. Class will be paired according to qualifying positions, and then advance to eliminations. All Run, NHRA Sportsman Ladder, Pro .500 Tree, Handicap Start. A 32 or less car field will be laddered on a sportsman ladder. A 33 or greater car field is randomly paired and run until the field reaches 32 cars or less. When the field reaches 32 or less cars a sportsman ladder for the number of cars remaining will be used to pair the cars. Car placement on this ladder will be determined based on reaction time for the last round that was randomly paired. Nostalgia Super Stock is an index-style foot brake only class for the year models, body styles, and engine combinations, which accurately represent those cars, which raced in the A/FX and Super Stock classes of the ’60s. Certain exceptions in the authenticity of these cars will be allowed. Among those exceptions, but not limited to, are factors concerning safety, equality in ­performance, availability, and durability. Classification will be based on a visual inspection and an ET range. No modifications, which alter the car from factory stock, are permitted unless they are specifically allowed in these rules. Sandbagging, excessive braking near the finish line or excessive mph for a given e.t. is subject to result in a disqualification. Nostalgia Super Stock is an all run field, and will compete on an NHRA Sportsman type ­ladder. The class will qualify by elapsed time closest to index, be paired according to qualifying positions, and then advance to eliminations. All qualifiers in Nostalgia Super Stock must have a valid elapsed time recorded to be placed into eliminator competition. Nostalgia Super Stock racing will be conducted at all drag racing events (see race schedule). Nostalgia Super Stock is an index-style foot brake only class for the year models, body styles, and engine combinations, which accurately represent those cars, which raced in the A/FX and Super Stock classes of the ’60s. Certain exceptions in the authenticity of these cars will be allowed. Among those exceptions, but not limited to, are factors concerning safety, equality in ­performance, availability, and durability. Classification will be based on a visual inspection and an e.t. range. No modifications, which alter the car from factory stock, are permitted unless they are specifically allowed in these rules. Sandbagging, excessive braking near the finish line or excessive mph for a given e.t. is subject to result in a disqualification. 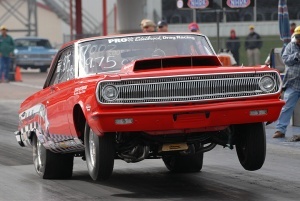 Nostalgia Super Stock is an all run field, and will compete on an NHRA Sportsman type ­ladder. The class will qualify by elapsed time closest to index, be paired according to qualifying positions, and then advance to eliminations. All qualifiers in Nostalgia Super Stock must have a valid elapsed time recorded to be placed into eliminator competition. Nostalgia Super Stock racing will be conducted at all drag racing events (see race schedule). Doug Duell driving the Drag'n Wag'n was the Nostalgia Super Stock Champion again for 2010. 2009 had the NMCA change the points championship calculations to a "Chase" Style -- where the points gaps would get tightened up after the firth race. While it came down to the last race in Memphis, Doug Duell beat out Stephanie DiMino for the NSS Points Championship for 2009. This page was last modified on 28 November 2016, at 19:50.